The plunger has two roles. 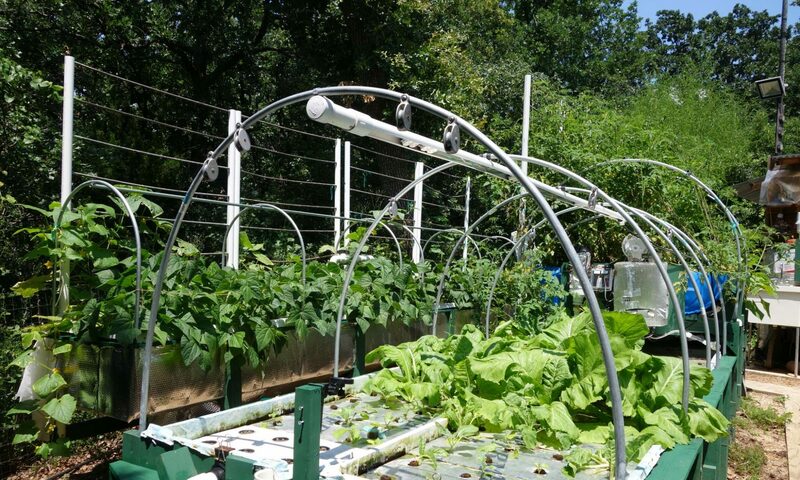 When it goes down, it pushes on the frontmost syringe piston and dispenses reagent. When it goes up, it lifts the stopper, so that at the upmost point of the plunger travel, the reagents are capped by their stoppers. 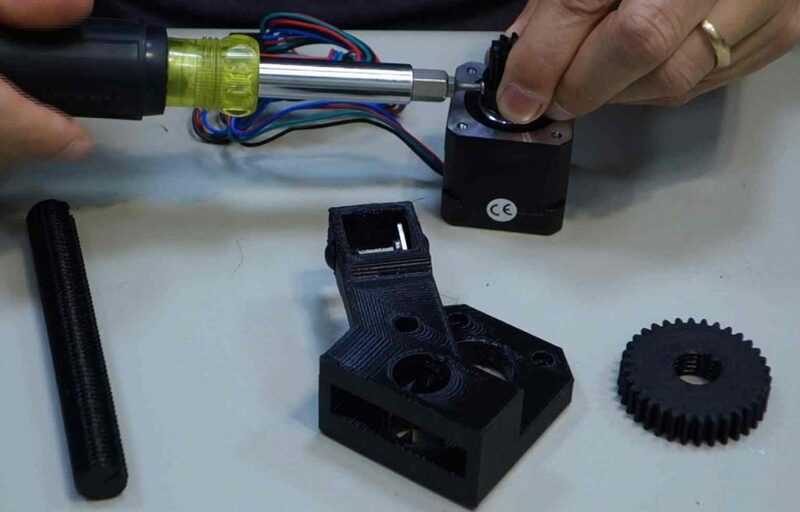 The first step is to attach the plunger drive gear to the stepper motor. As with the carousel drive gear, a M3 nut is inserted into the bottom of the gear and a M3x6mm screw is tightened against shaft. 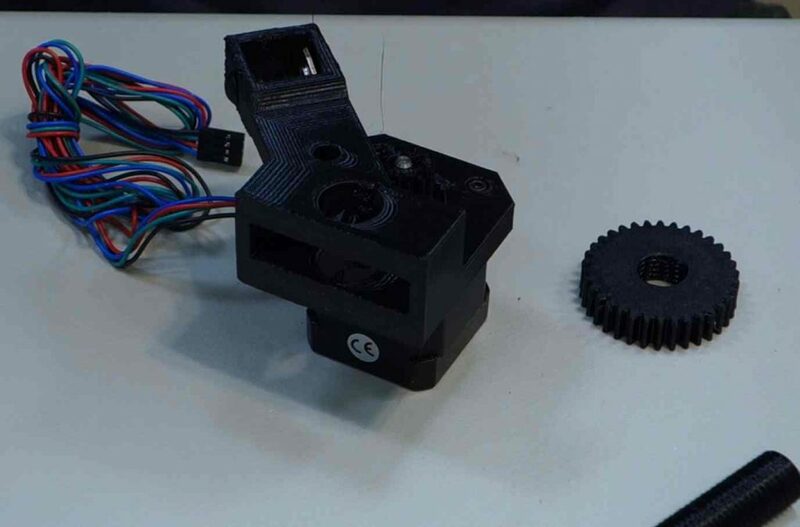 The motor is attached to the stepper mount using M3 screws. 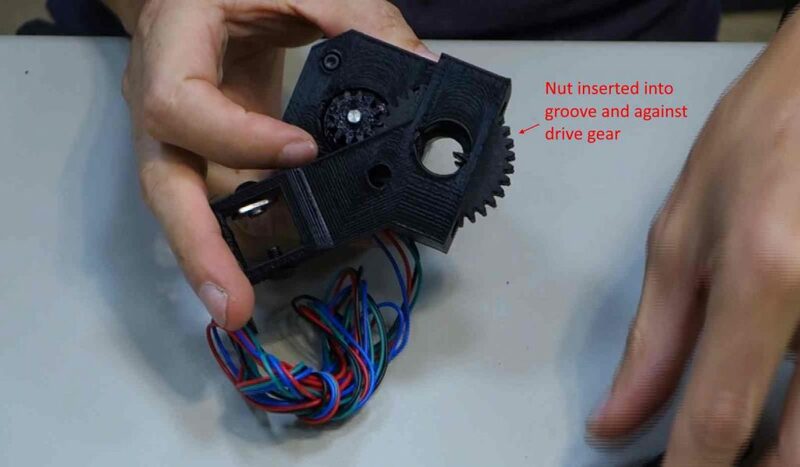 Next the plunger nut (the large gear) is inserted into the mount hole such that it fits against the drive gear and the threaded hole in the nut aligns with the mount hole. The threaded screw is then inserted into the hole. The groove in the screw aligns with the spike in the mount. The screw will not turn due this spike, however the rotation of the nut will move the screw up and down. 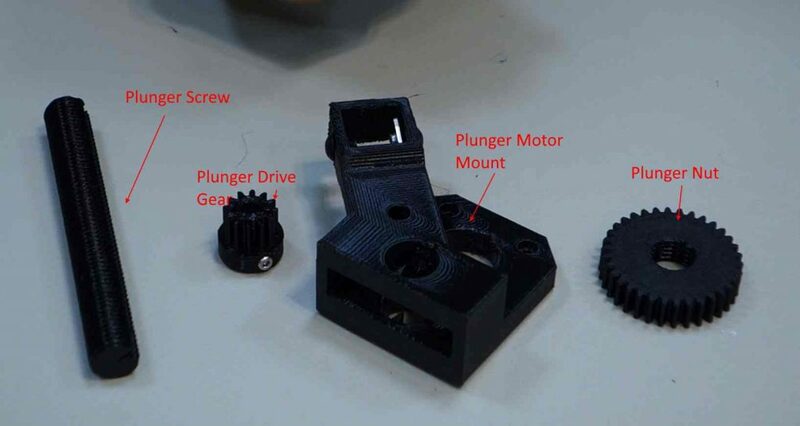 Finally, we want to connect the plunger assembly to the 320mm piece of extruded aluminum. 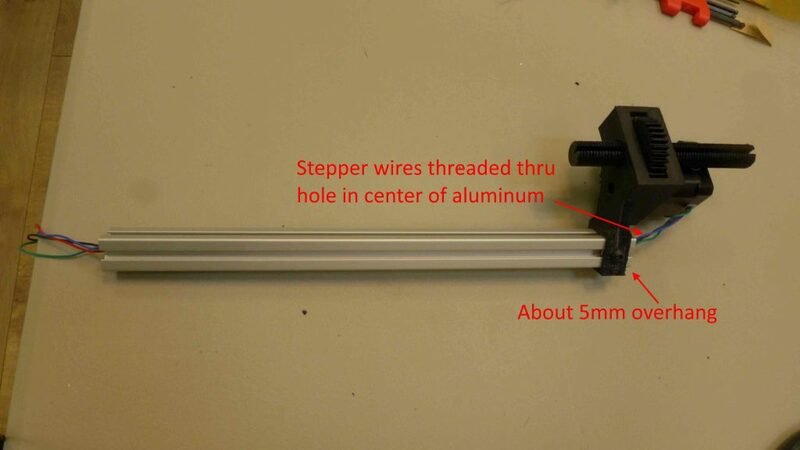 We want the aluminum to extend about 5mm past the top of the plunger assembly. We can adjust the height of the plunger up or down as part of the assembly process, but I have found the 5mm gap to be about correct. 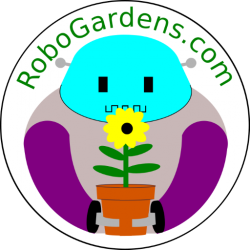 The wires from the stepper motor should be threaded through the hole in the 2020 aluminum. 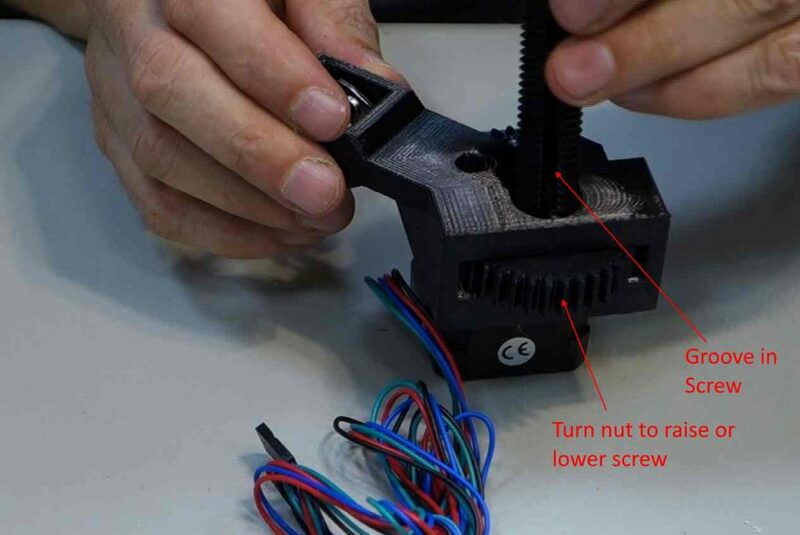 This will require clipping off any connector at the end of the wires, but this build connects the stepper using screw terminals in any case.